Once upon a time, David Milne used to arrange all the old things from his parents’ house in the attic of their home to create his own world of play. 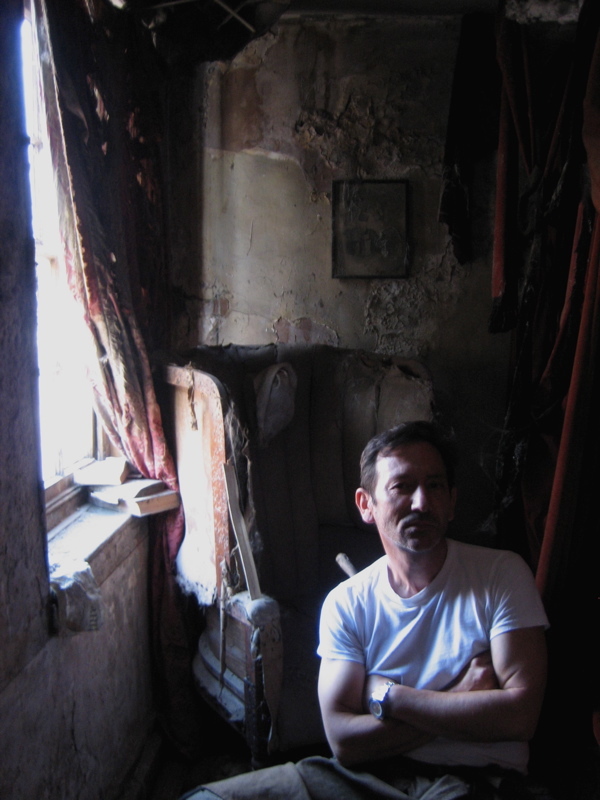 David is pictured here in the attic of Dennis Severs’ House in Folgate St where today, as curator of the house, it is his job to arrange things – both in the general sense of maintaining every aspect of the property and also in the specific sense of arranging all the myriad objects that fill these crowded rooms. Yet the success of David’s arrangements renders his labour invisible, since when you come upon the artifacts occupying these rooms, everything appears to have occurred naturally in the course of the daily life of the fictional inhabitants. But very little is accidental in this house of mysteries, because everything has been arranged to tell a story, and making those arrangements is David’s tour de force and his life’s passion too. “I think I have a good understanding of what the life of a servant must have been like, except I am the servant to an imaginary family,” David confided to me after years of cleaning and polishing. Widening his eyes significantly as he revealed his qualification, “though I am a very taxing master – because everything has to be right.” and underlining the statement with such a stern glance that I almost felt pity for him, suffering such an exacting scrupulous employer. I recognised the glance from when David instructed me to hold silence upon my arrival at the house, when I came to visit during a public opening. It was a look of such gravity that it ensured silence reigned throughout the property, no-one dared utter a word in the face of such an authoritative visage. Yet this hauteur only serves to emphasise the unexpected radiance of his smile when you greet him off duty, because the evocation of fantasy at 18 Folgate St is a serious business and David understands his dignified responsibility to set a certain tone whilst at work. It is an onerous duty that magistrates, members of the clergy, footmen and the guards at Buckingham Palace will recognise, and one which David has perfected to an art. 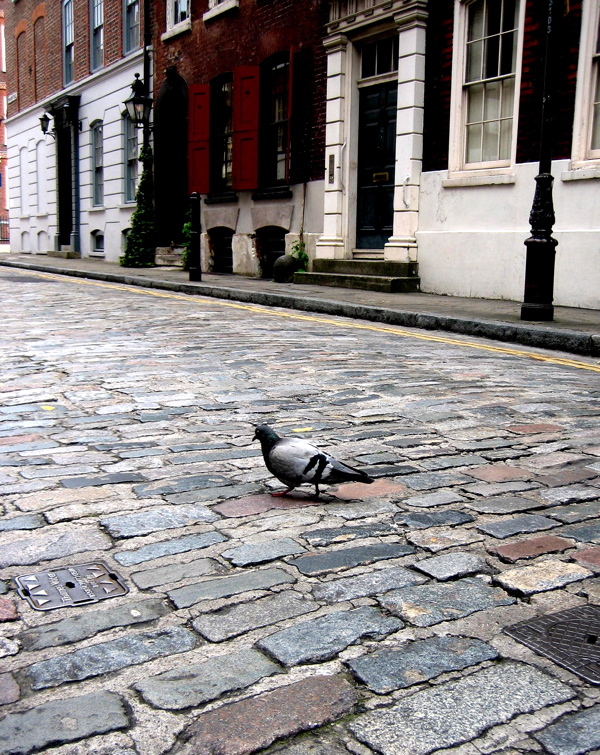 David discovered 18 Folgate St in his early twenties when was exploring London by following the medieval street plan and he came upon Norton Folgate while walking up through Shoreditch. He peered through the lattice-work of the dining window and spied the baroque interior. “Spitalfields at that time was dark and faded, as if the eighteenth century inhabitants had simply locked their doors and gone, and because I had seen into one of the houses, my imagination created the stories in all the others.” he told me, recalling the moment with delight. I realised how unusual it was for David to sit and talk, because his job consists primarily of housework, revealed by the long apron that is his professional uniform. All four storeys, staircases and rooms, are cleaned twice a week, the silver, brass and copper are polished every fortnight, floors and furniture are waxed annually, bed and table linen are laundered and starched regularly, and dusting is a continuous activity. Additionally, the food is prepared daily, with the master’s breakfast cooked every morning, and tea and coffee freshly brewed. It takes all day, while the house is closed, to prepare it to open for visitors, because even maintaining imaginary inhabitants in the patina to which they have become accustomed takes a lot of work. Such a brilliant writing about Mr Milne. I also have visited the house many times and the house captures and absorbs you into it’s history. I was emotional when I visited at Christmas time; the door opened slowly and the smell of fresh pine and cloves put a lump in my throat. It is a experience that I doubt could be found in many places worldwide. thank you so much for looking after Dennis Severs house. it was my first visit last night and I loved it. what dedication !